Finally home staging is getting the recognition it deserves. We at Sans Pareil Real Estate can can't stress the benefits enough. Read what the Home Staging Experts have to say! 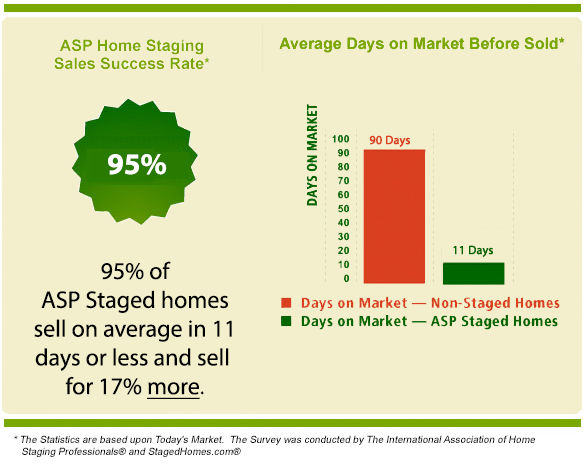 "Your Investment in ASP Home Staging will always be less than your first Price Reduction"
Home Staging is the process of preparing any home for sale, regardless of price or location. Using a proven, professional set of guidelines your house is reviewed for compliance with preset standards, and any necessary modifications are made. Once your house meets these criteria, a Staged Home Certificate will be issued and your home will be registered as a Staged Home. This entitles your home to a special marketing program developed to promote those homes which have been designated as Staged Homes. This unique system has proven to help sell homes faster and/or for more money. Real estate agents will have great confidence in showing your home to potential buyers because they know it is Staged and ready to be sold. Whether a buyer, seller, or real estate agent, the home selling and purchasing process is fraught with potholes that can usually be overcome. But in this weakened housing market, everyone involved in the selling process must increase their efforts. In order to sell homes at top dollar, houses must be “prepared for sales.” That’s where Staging comes in. The real estate mantra is no longer location, location, location. It is now Staging, Staging, Staging! It’s all about presentation. Our in house ASP Stager Chrisa Oakley uses winning tactics, secrets, and strategies for selling a home at top dollar during these challenging times. In addition to offering specific tips on how to Stage a home, Chrisa works with our Sans Pareil Realtors on correctly pricing properties, marketing properties so that they sell, addressing objections early on, having the seller handle the Staging before the house is viewed, and much more. With today’s turbulent real estate market in mind, Chrisa works with agents and homeowners to get their homes Sold in the market quickly for top dollar.